Barcelona is the first place in Europe to have seen cocoa beans. Christopher Columbus, having encountered the beans used as currency and as a drink by the Aztecs, brought some beans with him to Spain and presented them to King Ferdinand and Queen Isabella. The beans didn't make much of an impression. It wasn't until a generation later when a Spanish explorer, conquistador Hernando Cortes, returned to Spain with beans and a means of processing them into a bitter drink that chocolate was embraced by the Spanish nobility. You can find fancy chocolate shops around Barcelona. During our trip, we made stops at several xocolaterias to pick up bars of chocolate or dip churros into hot cups of chocolate. 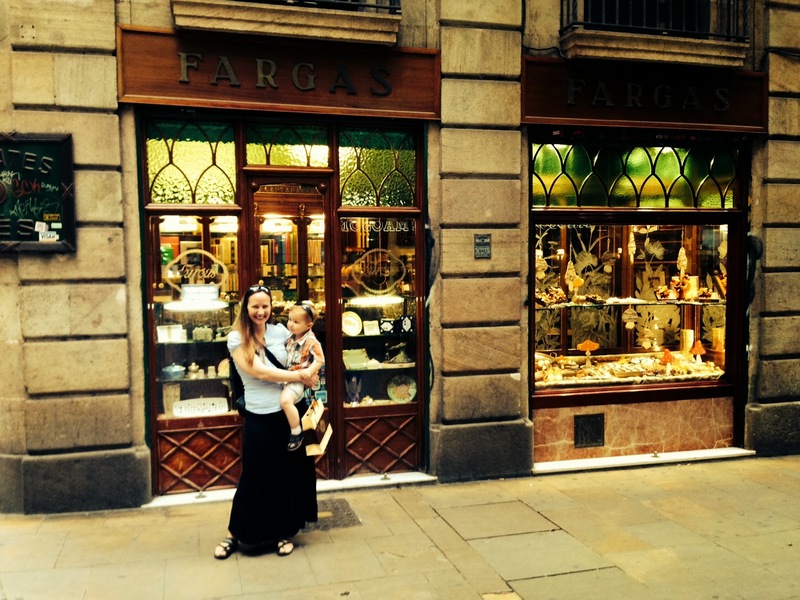 Our favorite was the fancy Fargas chocolate shop, founded in 1827 and still crafting handmade chocolates. Kate chose between dark chocolate bars, really dark chocolate bars, and really really dark chocolate bars. The local chocolate confectioners established the Museo de la Xocolata in the El Born neighborhood. It provides a solid background on the development of chocolate from Aztec times through the modern day, but the real focus of the museum is stolen by all the magnificent chocolate sculptures displayed throughout the building. This museum definitely enthralls the visiting children; it was a highlight of the trip for Jackson. Kate and I thought it was a fun stop for us, too, from the chocolate bar as our admission ticket to the chocolate shop at the exit. Mixer with rotating wheels of granite that liquefies the chocolate nibs and mixes them with sugar, cocoa butter, spices, and other flavorings. The chocolate sculptures are generally created by local chocolatiers who use them as displays in the their own shops for holidays such as Easter and Christmas, and then eventually bring them to the museum. Thus, the museum benefits from an ever-changing series of displays. It's a Komodo dragon, we explained to Jack. Here's what he understood: "A dragon!" La la la-la la la / Sing a happy song / La la la-la la la / Smurf your whole day long. How long is that gonna be stuck in your head today? Don Quixote tilts at windmills. Nativity Facade of Sagrada Familia. Wow, and here I thought chocolate was only good for eating! I wonder what happens to the sculptures after they're ready to discard them. Are they edible? Were they edible when they were made, but not any longer? Can the chocolate be recycled for a future sculpture? Or are they just thrown in the trash?